Firstly, I wanted 1 hr for the driver to arrive at my hotel. Then more waiting later to get to the boat. At the end of the day, the driver didnt show up, so we ended up waiting again. I would say - find a better local operator. Loved this trip to Angthong National Marine Park. Although, at the time of going on this trip, the actual park was not open and so we did not set foot on the island with the big Emerald Lake. Apparently the park closes for one month every year and when we booked it was a couple of days prior to the reopening of the park. As a result, we did a slightly different tour we still went to the same place to snorkel and swim visited Monkey Island and other landmark rocks had lunch at a nice little island and then had the opportunity to do an hours Kayaking. This was along a beach and was rather scenic although someone spoilt by the amount of rubbish washed up on some of the beaches. I think the tour company would do well to offer each person a plastic bag and say that the person who collects the most rubbish can get their trip costs refunded. After all, if the rubbish builds up too much people wont want to come. But aside from this small issue, the trip was fun. The guide had good clear English and was very tolerant of the constant translation going on with the Japanese tour group that was our trip. The crew was young, helpful, enthusiastic and made the trip fun. I wasnt expecting much visibility in the water, but it was surprisingly clear about 10 metres visibility. The lunch food was good and fresh. 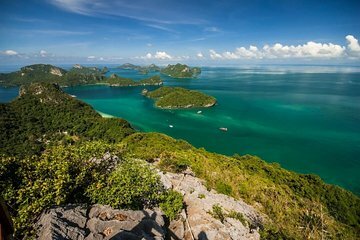 Id recommend this tour to anyone who wants to see the Angthong National Marine park and surrounding area. Worth every we spent. Fabulous trip. Do not miss this trip. This memory will stay with you for a lifetime. The organization is good, the travel to the islands with the speed boat doesn't require too much time.